I'm adding some new playerships into Shrike's Mines and Missiles that are basically varients of stock NPCs. Unfortunately, these are often using 20-facing graphics and lack a hero image for the ship select and ship-interior screen. Fortunately since George has released a new version of the TransArt dump, it's possible to re-render anything into 120-facing glory. Unfortunately, my computer (and my incredibly low knowledge of TrueSpace) isn't up to it. If anyone's able to help out by doing some renders for me, please let me know. You'll obviously receive a credit entry in SM&M++. Alternatively, if no one's available, I will continue with my own approach to solving the problem of missing stock art. I will need to update Playership Drones with the new ships, and I will check out TransArt170 sometime. Right now, I am focused on updating the Drake Technologies mod (for both parts 1 and 2), but after that, I will get to Playership Drones. After I work on Playership Drones, I will probably have updated re-renders available, which you can plunder. I suppose I can spare the processor power, but I'm not sure I want to take the time to figure out how to do it. Has anyone created a step-by-step procedure using free software? And speaking of PSD, the Penitent ships have new HD graphics in vanilla, so the overrides for those should be removed. George kindly volunteered some of his time during the RC1 devtime to do the renders for me. However I think a guide for rendering out of Truespace might be pretty useful at some point. @ NMS: I know, I have not worked on PSD much lately. I will update it when I can. Shrike wrote: Fortunately since George has released a new version of the TransArt dump, it's possible to re-render anything into 120-facing glory. Unfortunately, my computer (and my incredibly low knowledge of TrueSpace) isn't up to it. Not everything. TransArt170 has few, if any, models for things not in Stars of the Pilgrim. 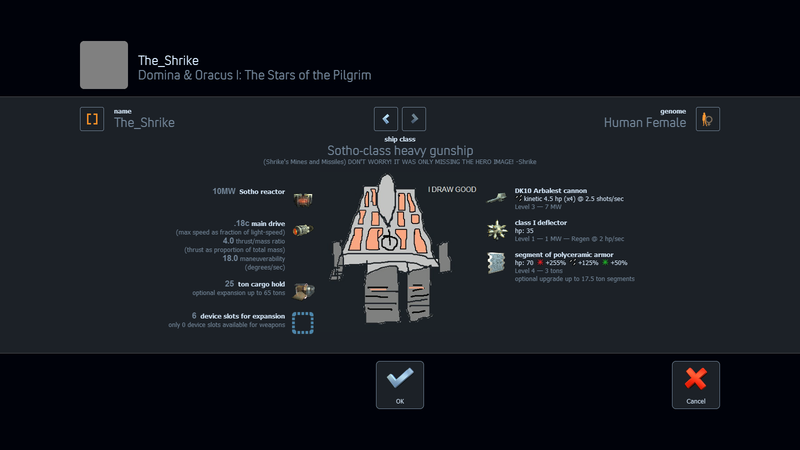 Hero images for expansion ships in PSD will still be blown-up sprites. However I think a guide for rendering out of Truespace might be pretty useful at some point. Also, if somebody could make a list of what has been updated in the transart file, I can extract it with the LUUV plugin and make OBJ files.